Larger, tasty strawberries that offer 20 per cent saving on labour and almost no wastage demonstrate that the benefits of breeding extend far beyond yield. Flavour and nutritional content can also be increased to improve profitability and meet health challenges. This is the subject of the next Agri-Tech East event ‘Nutritious and Delicious – Innovations for Value-Added Crops’ on 22nd February at the Institute of Food Research in Norwich. 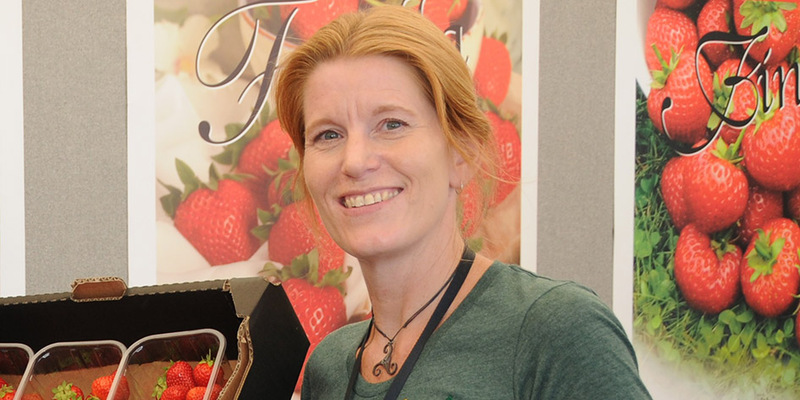 Abi Johnson of NIAB EMR (East Malling, Kent) says that the new variety of strawberry ‘Malling Centenary’, launched recently, has saved one Kent grower £3,500 per hectare in one season. “The new strawberry provides the same yield per hectare as the industry stalwart Elsanta, but it has a sweeter flavour and is larger. It is easier and faster to pick, is more consistent in quality and has a longer shelf life. These qualities combine to reduce labour costs and make it more desirable to the supermarkets,” Johnson explains. The Strawberry Breeding Club at NIAB EMR has made a significant impact on the strawberry market. Since work started in 1983 the season has increased from four weeks to ten months and transformed the nutritious fruit from a special treat to a regular snack. A similar revolution is predicted for wheat-based products. Dr Brittany Hazard of the Institute of Food Research is looking to meet the global health challenges of obesity and diabetes by redesigning the starch in wheat. “You’ve probably heard that when you eat refined or processed starchy foods your blood sugar can rapidly spike but your energy levels aren’t sustained because everything is digested very rapidly,” she says. There is increasing pressure on governments to tackle the health problem and demand from consumers for nutritional snacks so this type of wheat could command a premium price. The techniques being used to develop these improved breeds using recent advances in our understanding of the genome, and the way in which the value-chain needs can be addressed, will be among the topics discussed at this interactive Agri-Tech East meeting. Member organisation Agri-Tech East is an internationally recognised catalyst for open innovation and collaboration across the industry to help improve the productivity, efficiency and sustainability of UK agriculture and horticulture. Other speakers at the meeting will include: vegetable breeder Dr Richard Tudor on behalf of Elsoms, crop geneticist Dr Judith Irwin of John Innes Centre, vegetable specialist Bruce Napier of NIAB, and entrepreneur Alex Fisher, CEO of Saturn Bioponics. The event ‘Nutritious and Delicious – Innovations for Value-Added Crops’ will be held on 22nd February at the Institute of Food Research, Norwich Research Park, Colney Lane, Norwich, NR4 7UG. To register, please visit the Agri-Tech East website: www.agritech-east.co.uk/events.